We always want to share the things we love with our friends, coworkers and family members — that's human nature. And it's a generous impulse, the desire to share. But how can you introduce your most beloved TV shows, movies, comics and books to people without turning them off? Here's a step-by-step guide. Choose your target carefully, and realistically. 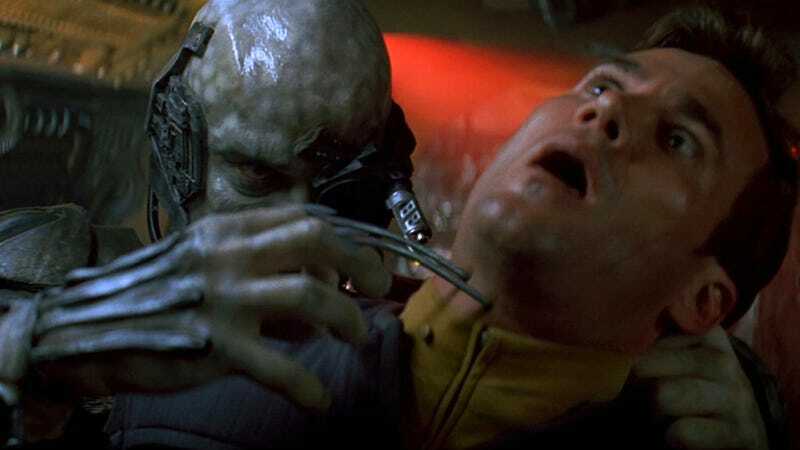 You're trying to assimilate people into your collective, but you're not actually the Borg. Resistance isn't actually futile. So you want to pick someone who is pre-disposed to be interested in whatever you're a fan of — if it's a giant book series, don't try to pitch it to someone who never reads books, for example. That sounds pretty obvious, but we've all suffered the heartbreak of trying to interest our friends and family in stuff that they were never going to be into. Don't ram it down anybody's throat. Make it a personal share rather than a proselytizing thing. Mentioning that the latest episode of this show totally rocked your world, or that you went to a convention and saw a great panel, is way more effective than saying, "You need to be watching this." Make it way more about how much you're personally enjoying the thing you're enjoying, and then other people will wanna get in on that. Assess the barriers to entry. How many episodes do they have to watch before they probably get into it? How many episodes do they have to watch before they're caught up? Or how many books or movies are there? Do you need to consume all the tie-in media to make sense of everything? If the barrier to entry is indeed high, like with a show that's already been on the air for 10 years, try to find a jumping-on point that's less daunting. Or offer to give your friends a crash course in everything they've missed thus far. Go easy on the in-jokes. Figure out what this person already likes that is similar to the thing you like. And find ways to bring up the similarities — like, if they mention that they really like Outlander for its time-travel romancey stuff, mention casually that Doctor Who has a lot of romance with its time travel nowadays. Be prepared to show interest in their stuff, too. This is a two-way street. If you want other people to be interested in your She-Hulk obsession, then you have to show at least some interest in their Sailor Moon fixation. It's only polite, plus maybe you'll discover something that you're actually really into. Once they're interested, back off. Apart from anything else, this is the best way to hook them into your evil scheme of permanent addiction to your favorite crack. Make them come to you next time, so that they can figure out for themselves how much your casual hints about the greatness of Finder have intrigued them. Be super patient with their questions. Be prepared to pause and explain stuff a few times. This will be annoying, but you signed up for it. Get used to seeing William Shatner's face frozen in time for five or ten minutes while you explain all of the backstory and just how this stuff works. Don't throw them in the deep end. Don't show them the ultra-cool episode that makes no sense unless you've seen 100 other episodes. Start with the episode that is basically zero set-up and all payoff. Or with comics, lend them the trade that has the first issues of a new run or a new storyline, with minimal references to what's gone before. Be prepared for them to talk your ear off about it. This will be the most annoying part — the zeal of the newly converted. Once your evil plan has succeeded, be prepared for this person to follow you around talking to you about "Wasn't it cool when Blake said, 'No, I'm coming back'?" "Didn't you just love Brian Blessed as an evil prison-planet cult leader?" "When are Blake and Avon going to get a room already?" There's nobody more passionate than someone who's just discovered something for the first time — and now you have to live with this person. Congrats!